This basket has a length of about 8.5 in, a width of about 8.5 I, a height of about 2 in and a Net WT of 2 pounds. Brighten someone’s day with this bountiful assortment of treasures created by the sun! So tasty and full of natural goodness. Contains Salted Giant Cashews, Colossal Pistachios, Salted Jumbo California Almonds, Jumbo Apricots and Dried Pineapples. Net wt. 2 lbs. I sent this item as an anniversary gift. They loved it! Everything was fresh and tasted fantastic . My dad is always pleased when I send him a gift from this company! I was able to select and order what looked like an attractive gift option. The order arrived on time and in good condition, and the recipients were delighted with it. ProsEasy to order, delivered as expected. Ordered this as a gift, and my friends loved it, especially the addition of dried pineapple and apricots. ProsNice arrangement. Lovely, reusable, quality basket. Easy ordering process. Arrived quickly. I have been ordering this basket for several years and always had rave reviews from my recipients. Delivery is always fast and the 2 pounds make my previous website company look cheap and skimpy. I can not recommend the products quality or the company's service higher. All of the ingredients were fresh, tastey and beautifully presented. As a health conscious family, we really appreciated this basket of nutritious treats! ConsDidn't love the apricots...were not as sweet as they could have been. Loved it ! Was purchased as a birthday gift and it was delicious . Very fresh and super tasty . And it was delivered on time prior to birthday . Could not have been happier . Thanks . I got this for my mom for Mother's day. I wasn't sure but she lives in AZ and I usually try and get her chocolates but they always arrive melted into a blob. She was so pleased with this gift. She told me she loved dry fruit and I knew that pistachios were her favorite nut. The package arrived on time in great shape. I sent the nut and fruit box to my Mom for her 87th Birthday. She was so happy and said everything was delicious! I sent two of these baskets to family members that were having a difficult time. They loved the presentation, the nuts were great quality and the pineapple sweet...the basket was an added bonus. I will not hesitate to order from Superior Nut again. I sent this item to three different people, and they all raved about the presentation of the package and quality of the fruit and nuts. They've all enjoyed these, which gives me great confidence in Superior Nut Company. I've bookmarked the site so I can easily come back again and again. This was meant to be a Christmas gift. I ordered this item for a client as well as a couple different items for a different client. One delivery showed up around Dec 30th, while the other turned up on Jan 3rd. Both of these orders were placed on Dec 16th and didn't even ship from your company until after Christmas. That's not good at all. I would expect them to ship the day I ordered, or the day after at the latest. I've worked in a distribution warehouse before, and this would never happen, or our customers would cancel their order, or take their business elsewhere next time. Also, it took well over a half hour to place 1 order because the order taker on the phone could not get the shipping information, or the correct amount right. Then, wound up getting it wrong anyway. I have no comment about the actual quality of the goods since I sent it to someone else, and they just barely received it. I will think about it next time before I make another purchase. We found you on the website. Merchant Response:Paul, We are sorry to hear about the issues you run into when trying to place the order. This said, I have checked the tracking info on your order. FedEx tracking 564310200282 shows that the order was shipped the same day it was placed and that it delivered on Dec 18th. The order did not ship and/or deliver after Christmas as stated in your review. Please let us know if you have any other question. Best! I've been ordering items from Superior as gifts for my elderly parents for some time now. They always love the items and rave about the high quality of products provided. Thanks again for making this year's Christmas gift another winner! This Fruit and Nut Basket is a very nice gift. My father enjoys the nuts, and my mother loves the dried fruit. This is a very nice gift to send. I have ordered from Superior Nut for a few years now, and have not been dissaponted with any of their products. 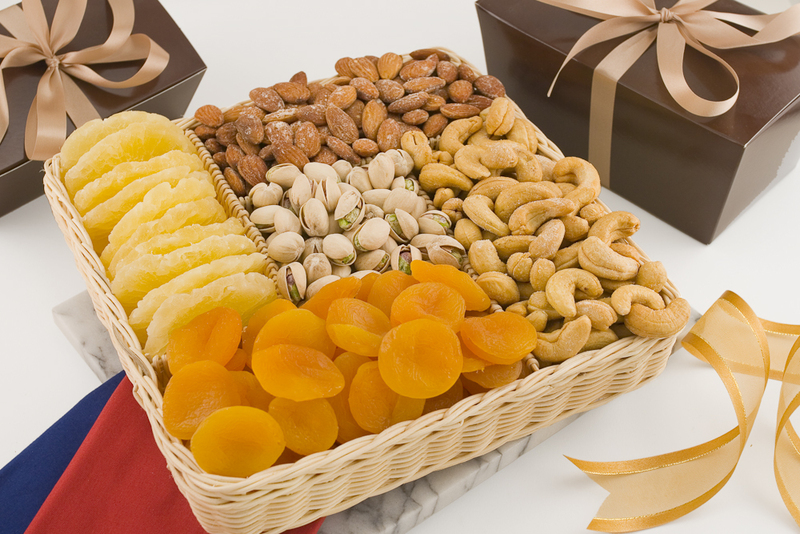 ProsNice assortment of fresh nuts and dried fruits. Quick delivery. Reasonable price. High quality. Sent this to my brother and sister-in-law for Christmas. They loved the combo of all the different selection of nuts and fruits in the beautiful basket they can use over and over again! ConsCan't get enough of a good thing! Relatives loved the gift basket! I ordered the fruit and nut basket for my sister and her family as a Christmas gift. I did not get a chance to see the basket myself, other than as it was pictured, so I can't speak about it personally. But she called after receiving the gift to say the contents were delicious and they really enjoyed them. Everything was delicious. The fruit was especially great! I received a basket a while back at Christmas and really enjoyed the freshness and quality. Since them, I have sent two different baskets to others. They seemed happy with their gift. I know we enjoyed ours. I would have liked to try the cakes that you offer but the shipping is expensive (compared to the price of the cakes). it was a gift. the only critique I have is that delivery was not until seven thirty in the eve. and they were out, but otherwise, everything was fine. This is about the 6th item I have purchased from your company this past year. All of the products, and all of the experiences have been "fruitful." Every item I have purchased has been well received by the recipient. It is very easy to order from your website. I ordered this for a double birthday present (twins), and they both loved it. They particularly liked the apricots, pineapple, and almonds. ConsI had it sent to my sisters in another state, so I didn't get any of it! record time and enjoyed by them and their visitors during the Holiday Season. Ordering was quick and easy. I got an email the next day saying it was shipped. I wish I would have gotten an email saying it was delivered. At this point i still don't know if it was delivered. The picture says it all. My family loved this one and it showed up just before Christmas for everyone to enjoy. A perfect gift for my vegan/vegetarian family. The basket is a bonus too. ProsQuality as well as value. This was a gift for my dad. The item was received very soon after the order was placed and he enjoyed everything in it. Great gift idea and so easy to complete the transaction from Australia. ProsSize of package and variety of content. Quick delivery. I've ordered nuts from here before for myself and have always been pleased. This is the first mixed basket i have ordered. I sent this to my family in Texas for Thanksgiving. I am told everyone really enjoyed it, expecially the pineapple. I purchased this for my mother's 83rd birthday and she loved it. Wonderful food basket for self or gift for others. Nuts and fruit were delivered on time and were fresh and tasty. ProsLoved the pineapple slices. Not too sweet with any artificial / preservative taste. I ordered this basket for my mother for mothers day, decided to send something different than the traditional flowers. She stated everything was very fresh and the pistachios were the size of her thumb nail, I was very pleased and will order again. Good quality products I would definitely buy again. High quality, good variety, great value. Sent this to my friend after her mother passes. She is a Kosher Jew, so finding something appropriate to send is tough. She got this after Shiva, but still had people visiting the house. She was happy to have something to toss out on the table that was tasty and attractive. I will definatley be looking you up for future gifts. This product was fresh and so tasty. The entire display was presented perfectly. I would order again in a heartbeat. I have visited the outlet in Cambridge MA and I have been going there for over 10 years. Superior Nut products rock! I purchased 2 of the same platters and sent them as a thank you gifts to two hospital executives. Both raved about it. Healthy but yummy alternative.